Jiangsu Kolod company launched series activities of promote foreign trade business ability | Jiangsu Kolod Food Ingredients Co.,Ltd. 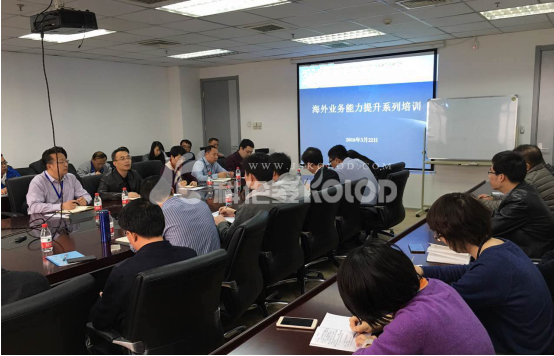 In October 30th, according to the strategy of Jiangsu Kolod company vigorously explore the overseas market, to further improve the overseas business executive ability, reduce the business risk of overseas project, Jiangsu Kolod company launched a four day “promotion” overseas business activities. The ability of training content mainly includes “foreign trade business knowledge, product knowledge and industry scale of overseas market”. 9:00 morning, the company held a ceremony. The company secretary of the Party committee, chairman of FengKuanYu 、general manager WengJingRong , assistant general manager and sales director ZhangYi participated in the ceremony. A well-off make an important speech on the ceremony, he pointed out that “a series of activities to enhance the ability of overseas business is business development needs, is to enhance the staff’s ability demand is the enterprise to the highest welfare of employees, this is we should attach great importance to concentrate on learning; the two is to strict discipline, reasonable arrangements for work and study; the three is to learn, to learn something. After the ceremony, the marketing minister ZhaungShiQian of the overseas market and overseas business training, he combined with the company’s successful cooperation with the Coca Cola Co in the case, to explain the characteristics of overseas market, foreign trade business personnel requirements, performance guarantee and contract content, the interpretation process of ZhuangShiQian according to his personal experience on some of the content of interpretation, the effect of vivid and interesting, inspire people to think deeply.